Lavender will run a Vet Q&A in our Pet Issues as well as online. If you have a question you’d like answered by a Veterinarian, email it to editor@lavendermagazine.com. 1.) I’ve got both a dog and a cat; are they both susceptible to Lyme Disease if I take them to a location that has deer ticks? What should I do to protect them? What happens if they contract Lyme Disease? Although both dogs and cats can become infected with Borrelia burgdorferi (the bacteria that causes Lyme disease) through tick bites, only dogs develop symptoms associated with clinical disease. Classic symptoms of Lyme disease include fever, joint pain (sometimes manifested as “shifting-leg” lameness), lethargy, and appetite loss. Less commonly, dogs may present to their veterinarian for concerns related to kidney dysfunction or other systemic illness. It is important to note that dogs typically do not develop “target lesions” at the site of the tick bite (once viewed in human medicine as a sign of Lyme infection) and obvious tick bites are often missed due to our pets’ thick coats. The amount and type of prevention required for a given pet depends upon their individual Lyme disease exposure risk. A dog that spends every weekend at the cabin is going to require more prevention than a highly urban dog. For dogs with low-level exposure, regular use of a topical flea and tick preventative may be adequate. These products are intended to actively repel ticks or to kill them before they can attach to your pet’s skin, take a blood meal, and spread the Borrelia organism, a process that can take 24-48 hours. Our clinic recommends the use of Frontline Plus or Certifect, topical liquid products that are used on a monthly basis. These products should be applied according to the manufacturer’s recommendations whenever the ambient temperature is above 40ºF. It is important to read warning labels carefully – some flea and tick preventatives contain insecticides or repellents that present toxicity concerns for cats and some humans. In addition, we recommend vaccination against Lyme disease for dogs that have significant tick exposure. 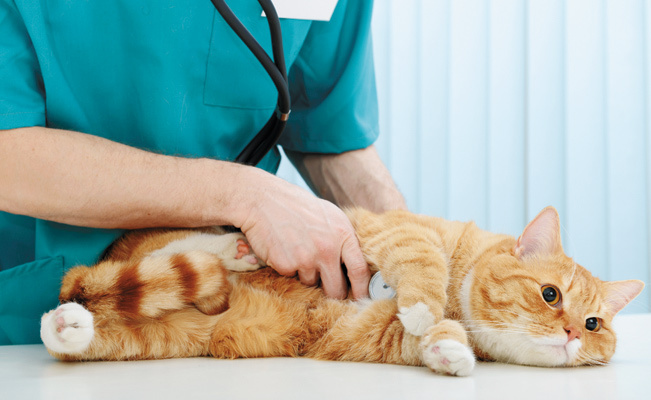 While vaccination is generally very safe, ask your veterinarian for specific recommendations if your pet has experienced an allergic reaction to past vaccinations or if they have a history of other immune-related disorders. If you suspect that your dog has contracted Lyme disease, please seek prompt medical attention. Diagnosis of Lyme disease may not always be straightforward due to limitations of the tests that are currently available. The most common diagnostics look for evidence of Lyme antibodies, which may be absent in the very early stages of disease and will remain in your dog’s circulation for months to years after infection. Specific tests used to confirm active Lyme infection are still being developed and improved. Blood and urine analysis, blood pressure measurement, and a thorough physical examination will help to assess the level of disease for any given pet. Uncomplicated Lyme disease in dogs often responds well to an extended course of antibiotics (generally doxycycline or amoxicillin) and supportive care. Overall prognosis may be less favorable for pets with more advanced disease or those with complications; some may require long-term care. Lyme Disease can be a serious health concern and prevention is the key! Talk to your veterinarian today to discuss an appropriate tick preventative and vaccination prototcol that will be right for your pet. 2.) Can pets get sunburned? Is there anything I should do to protect my pets? Simply put, yes. Pets with thin or light colored coats, or those with areas of missing fur, are at risk for sunburn. Areas on the belly or groin are also at risk for pets who spend time on their backs basking in the sunshine. Choosing a safe sunscreen is essential to avoid possible toxicity – look for products marketed for human infants or specifically for pets, and read the label carefully as some products may be safe for dogs but not for cats or other animals. Look for a product with SPF 15 or above and be sure to apply early and often (repeat every 4-6 hours if significant sun exposure is expected). 3.) What do you recommend for animals who are afraid of storms? Storm phobias are commonly encountered in our pets, and these issues often progress with age. Thunderstorm phobias can be more challenging to address than other noise phobias (i.e. gunshots, fireworks) because the storm itself presents your pet with not only a frightening sound, but also with visual and barometric cues. Management of a noise phobia can be broken into two major components used in conjunction with one another: behavioral medication and pharmacologic therapy. Pets with mild symptoms may respond well to provision of a light and sound-insulated space (i.e. a kennel covered with heavy blankets) or the use of specially designed garments designed to snugly wrap your pet to provide a sense of comfort (i.e. Thundershirt). These pets may also show improvement with training targeted at desensitization and counter-conditioning, techniques for which you can review with your veterinarian or an experienced dog trainer. It is critical never to punish your pet for phobic behavior as this will only reinforce their fearful response. If you have a pet with more significant phobic behavior during storms, the use of short or long-term behavioral medications may be indicated. Short-acting anti-anxiety medications (alprazolam, trazodone) are often a great first step, provided that they can be given 1-2 hours prior to storms. Some patients may also benefit from a secondary long-term medication (fluoxetine, clomipramine) during warmer weather if their symptoms persist. Tranquilizers (acepromazine) should be avoided, as they leave your pet’s mental capacity intact during use and can therefore worsen phobic behavior. Pet owners who wish to avoid medications may consider the use of calming supplements or pheromone collars. Ultimately, every pet is an individual – discuss your pet’s behavioral concerns with your veterinarian so that you can work together to formulate a plan for training and medicating your four-legged friend. Kevin Roeser, DVM, practices veterinary medicine at St. Francis Animal & Bird Hospital. Additional information regarding a number of commonly-encountered diseases and other helpful topics can be found at www.stfrancisanimalandbird.com.